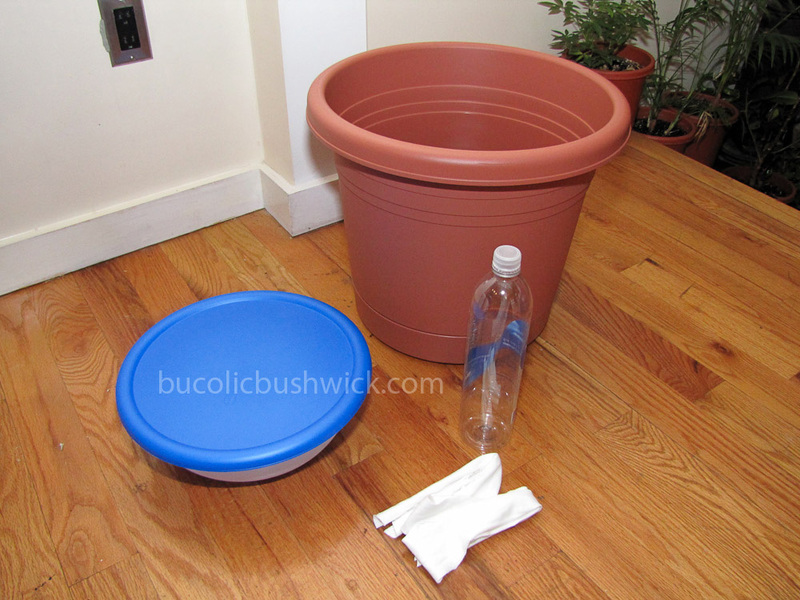 If you're interested in gardening with self watering containers, but still want to make use of your existing standard planters, here's a great way to convert all your planters into self watering containers. This project would also be good for gardeners interested in growing in self watering containers, but want something more visually attractive than storage totes. Try to find a container that matches your planter in shape and width. I lucked out and found a bowl that just fit into a 16" diameter pot. Mark the lid of the container with 1 large hole for the fill tube, 4 slits for the fabric strips, and a bunch of small holes for soil aeration. Also, don't forget to add an overflow hole near the top edge of the water reservoir. If you will be placing this planter on an uneven surface it's best to drill holes on all sides of the reservoir to ensure proper drainage. 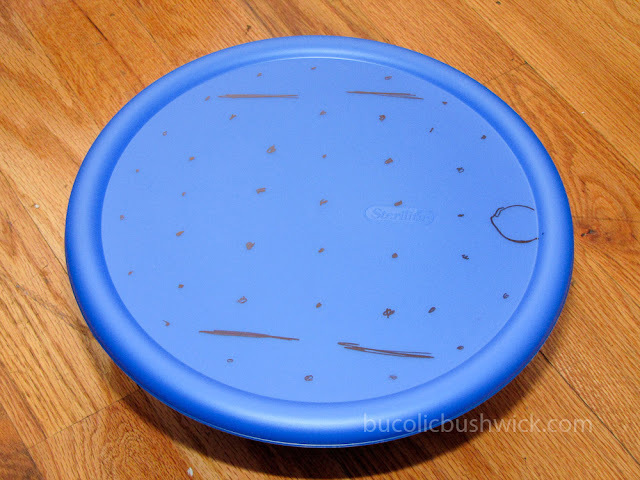 I used an electric drill to make the holes, but the plastic was soft enough that a sharp knife and elbow grease would have worked just as well. 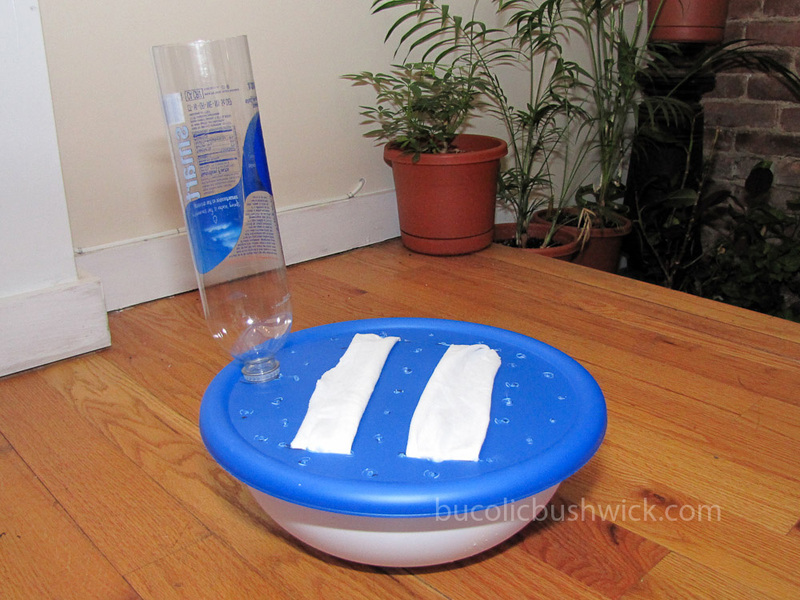 Insert the spout of the water bottle into its hole on the lid and insert the fabric strips into the slits. 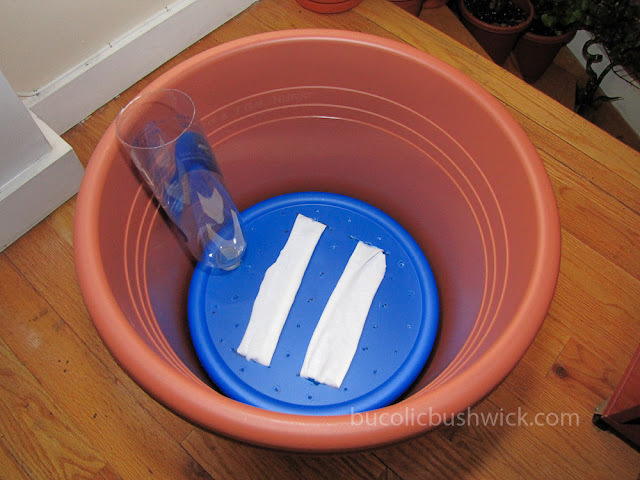 Make sure the fabric strips are long enough to reach the bottom of the water reservoir. Special Note: If you use 100% cotton for the fabric strips they will eventually biodegrade and will need to be replaced at the end of the growing season. Poly cotton blends or all synthetic fabric strips will last longer. 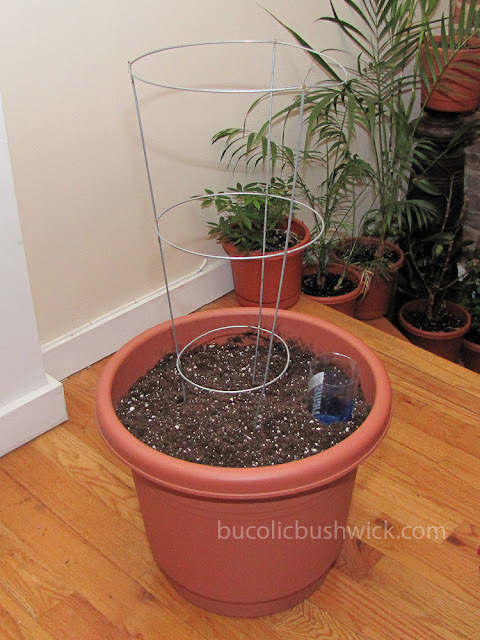 If you're going to add a cage to the planter add it before you add the soil. Have the spokes of the cage pass through the air holes of the reservoir so that the cage rests at the bottom of the planter. A cage that rests at the bottom of a planter will be much more stable than a cage that sits in only the top half of the planter. 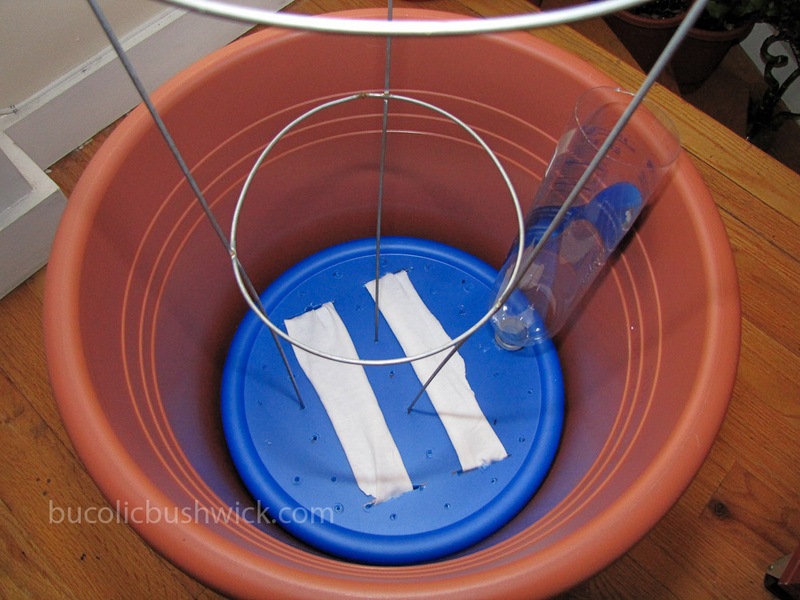 Top water the soil after it's added to the planter, then use the fill tube to fill the water reservoir. You can tell the water reservoir is full when water starts draining from the bottom of the planter. Add a tray to the bottom of the planter if it's staying indoors to catch the excess water. If you like this idea, but aren't interested in doing it yourself, you can buy a pre-made version at gardeners.com. I bought a few of these for the roof the first year I started gardening, before I discovered the fun of diy projects. This just, well, freaking fantastic. Thanks for posting! I have just discovered the whole self-watering container thing a few months ago and actually just spent a pretty penny on one from Clean Air Gardening based on some good reviews I read on Mr. Brown Thumb's blog and elsewhere. Hmmm...I could have spent less money buying a large plastic pot and lidded bowl, like you did here. Well at least I can try to apply your idea to the two half wine barrels I just scored from my landlord! I was looking for something to take up space in the bottom of them anyway! Can't wait to give this a try! Thanks from a fellow Brooklyn gardener! Hi Aimee, I'm glad you found this post helpful! This is great and creative! I was going to go shopping for some pots soon so I will keep this in mind. (sorry typo deleted previous post). Hi Charm City, welcome back! How are your seedlings doing? I think my seedlings are stressed since I check up on them every morning;P Can't take the pressure. Thank you very much for posting this! I think I will try using super-wicking micro-cloth (man-made chamois). What do you think? Hi K, sounds go to me, go for it! THIS IS SIMPLY MADDDD! You are brilliant, i like that watertight container as the reservoir, simple but yeah, why didn't i think of that??? anyway, you solved my problem, i was planning to find a solution for a friend who wants a garden and i want to introduce him to self waterting container, i am doing it for sometime now with recycled PET water bottles but i want to do something more presentable and subtle as my friend is an executive and he have a nice house, so it has to fit. you are heavensent!!!!! thanks! Thank you! I hope your friend enjoys gardening as much as we do. Hi Kirby, yes, both would work. The time between waterings would entirely depend on what you are growing in the planter. Some plants are thirstier than others. In general though, you can go several days without watering early in the growing season, when the plant is small to medium size. As the plant gets bigger and the days get hotter the time between waterings will decrease. In the height of summer tomato plants, for example, require daily watering. Peppers, eggplants, and cukes need to be watered every other day. In July and August I try not to travel because the garden requires daily monitoring. If I have to go I have a friend watch the plants for me. Sorry, I've never grown a fern in my life so I don't know if it would like this type of container. Hope you find an answer to your question. If you do, please update us here so other people can learn. Thanks for stopping by! Hello! There is great information here, thanks for sharing! I stumbled upon this blog because I am trying to find a way to make my built-in flower boxes self watering. I found this system(http://shop.flowerwindowboxes.com/38-Wickinator-Water-Reservoir-FWB-Wickinator38.htm) but I have like 10 window boxes, so it would get expensive. Do you think I could use this method for flowers, or do you think partially submerging a few water bottles with holes in the bottom to drip irrigate would suffice? I'm also looking for a solution for hanging baskets. Any advice you could give would be great. Thanks! Hi, I think water bottles for drip irrigation would suffice. 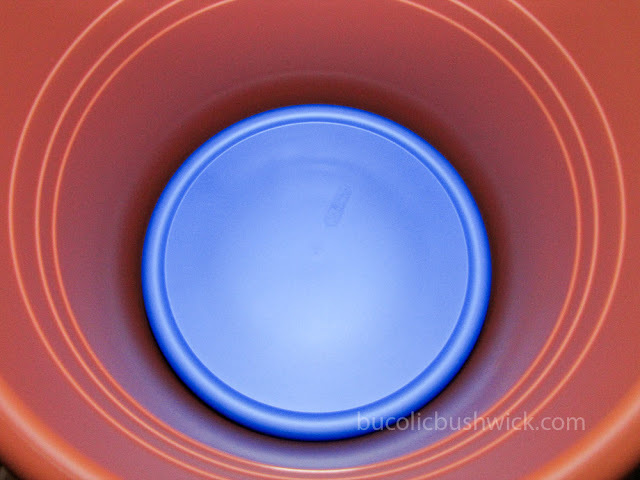 The appearance is not as attractive as the reservoir, but it also won't cost $20 per container. For hanging baskets I've heard people use diapers or maxi pads to retain moisture, not for edibles though, just flowers. Hi there, thanks for the great tip! Where did you buy the plastic tupperware? I've been on the hunt for something that's round and short like yours to no avail. I found it in a dollar store, hope you can find something similar! I am so thankful to have come across your post. Previously, I'd grown flowers on my deck. This year, I've graduated to fruit and veggies and worried as to how I could convert my traditional pots to self-watering ( without spending a fortune). Glad I could help. 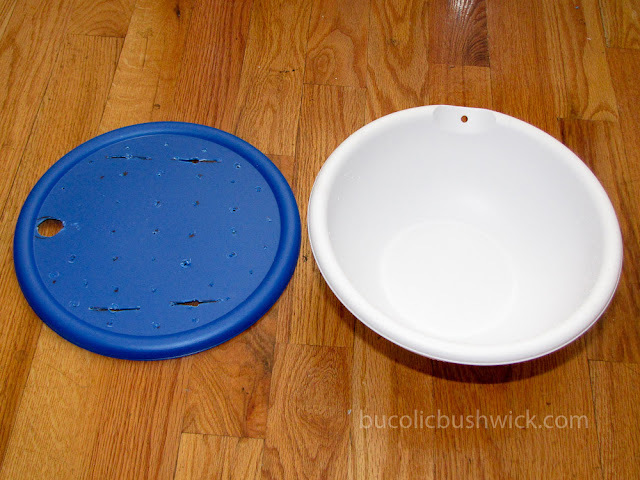 I find plastic salad bowls are good for round pots, those Gladware containers for square pots and plastic shoeboxes for rectangular pots. Happy growing! Why do you need the overflow hole? hate to keep pouring water/fertilizer into the reservoir and then have it flowing out and down through the bottom of the container. I had thought to stop pouring water into the reservoir when the access pipe/bottle was full.What am I missing? You won't want plants to drown in the rainy periods. They'll get root rot. Hi Lilly, yup that's another option that I wrote about in another post. Happy gardening!